Potatoes and black beans are both hearty fare. Combined together with onions, garlic and a bit of cumin to give them flavor, they turn into something more than the sum total of their parts. The potatoes take on a purple hue from cooking with the beans which always makes me feel like an alchemist in the kitchen. Top your potatoes with bottled salsa or any of your favorite chopped, fresh veggies. In the picture I minced a roma tomato and a small onion together. If I had cilantro or parsley I would have added some too. Instead I used a few wilted celery leaves as garnish. This whole dish, enough for 2-hearty servings, cost less than $1, less than 60¢ with careful shopping. That’s even including salsa or chopped onion for topping. Get out a small saucepan, about 1-quart sized. Chop the onion, you’ll want about 1/2-cup chopped, more or less. Heat the oil in your saucepan. Add the onion and garlic. Sauté for about 5 minutes, or until the onions are softening and fragrant. Add the cumin and a dash each of black and red pepper. Let the cumin sizzle in the fat for about 30 seconds while you stir. Add the broth, black beans and potato. Allow the mixture to simmer for 20 minutes, or until the potatoes are tender. The mixture will be juicy but not soupy. Serve in bowls topped with salsa or finely minced fresh onion, sliced tomatoes on the side or a scoop of canned, no-salt-added tomatoes on top. Togurt or yogurt or sour cream can be spooned on top too. Sautéed yellow squash or zucchini is a good accompaniment. This is a filling dish. Makes 2 or 3 servings. 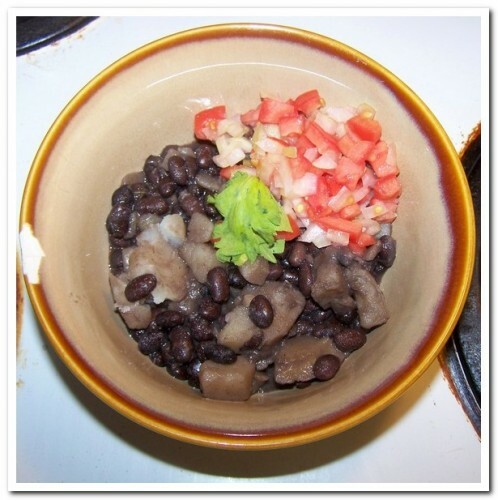 Assuming 2 servings; prepared with 1-teaspoon oil and 1-1/2 cups no-salt-added black beans. Per Serving: 308 Calories; 3g Fat (9.7% calories from fat); 15g Protein; 57g Carbohydrate; 14g Dietary Fiber; trace Cholesterol; 197mg Sodium. Calories By Percentage: 10% Fat; 72% Carbohydrate; 19% Protein. Exchanges: 3-1/2 Grain(Starch); 1 Lean Meat; 1 Vegetable; 1/2 Fat.